Below I will show you the commands and screenshots of what you need to do, to make this change on your MySQL server. First you add the hard disk to your system, to do this you sadly have to turn off the server. Turn off the server, and add the seconds hard disk, if you are running it in a virtual environment like VMware, you have to add a new disk to the virtual machine running your MySQL. Once your server is started up again, log in as root or another user with root privileges. If you have more than two hard disks in your server, there will be more in this list, incremented by the last letter, e.g. sdc, sdd, sde and so on. In this guide, you have to replace “sdX” with the hard disk’s letters you just added that contains no partitions, in this example it would be “sdb”. 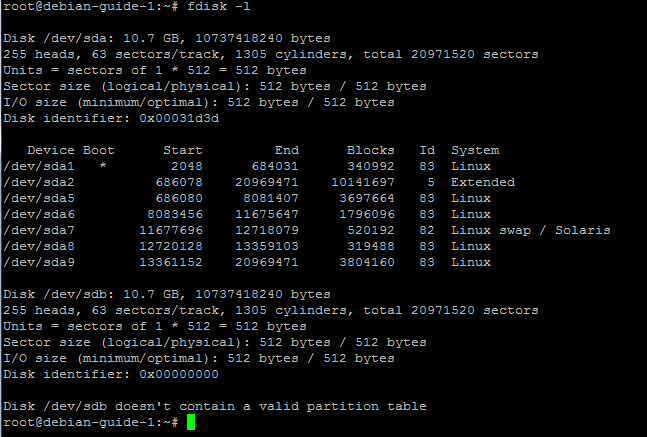 As you can see, I have a lot of partitions on sda, but sdb is empty. The hard disk I added (sdb) is 10 GigaBytes in size – if this was for a production MySQL, I would recommend a little bigger because hard disk space is so cheap today. But since this is only for the guides purpose, 10GB is more than enough. Right now you only have a RAW hard disk on your system, with no data, no partition table and no partitions, so you have to create those things before you can use the hard disk. You should see the following output, and you are not returned to the shell, since you just run a program and are still running it. Now type “p” and press Enter to choose that the partition has to be a primary partition. Now press Enter again to verify the default “First sector” of “2048”. Press Enter again to verify the default “Last Sector”. By choosing the default, the partition will get the space of the entire hard disk. Since we are only creating one partition this is the way we want it. Now type “write” and press Enter to write the changes to disk. You now have your hard disk, partition table and partition, only a few more commands are needed until you can use the hard disk. You have to create the filesystem, since the partition is still empty. There are many file systems out there, and they all have their advantages and disadvantages. 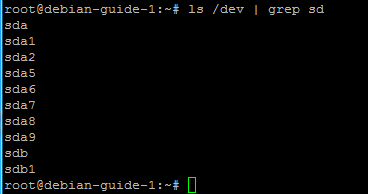 “ext4” seems to work out pretty well for me and I like it, so that’s what i’m going to use in this guide. 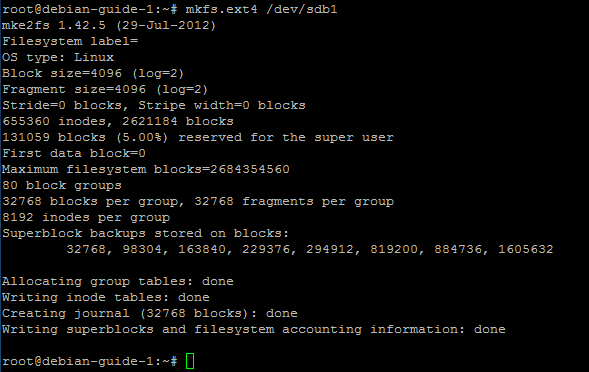 I also recommend ext4 for MySQL data, because it’s a little bit more reliable than some other file systems. This might take a minute or two, depending on how big your partition is, mine is only 10GB so it took less than 5 seconds. 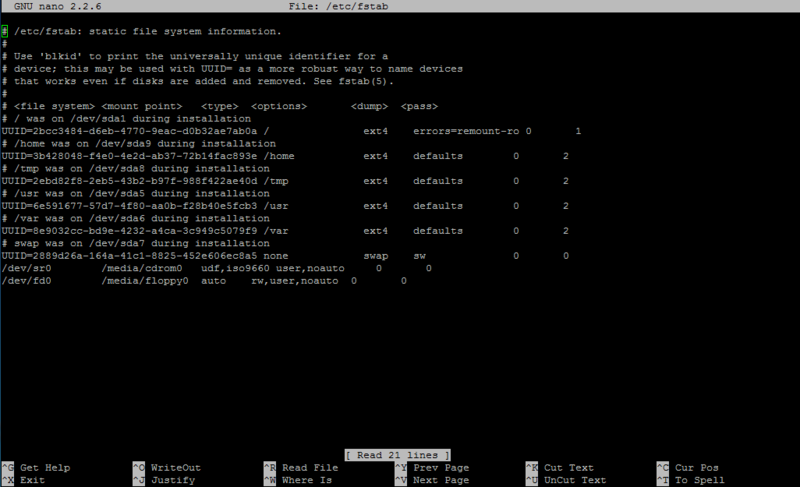 The filesystem has now been created, only one step left! To use the new partition, you have to “mount” it, this is what you do to tell the the server where and how to access the partition. You do this by first creating a new folder where the partition has to be mounted later on. In this example, I will use “/mysql_data”. Now you have a new empty directory with the name and path “/mysql_data”, so the next step is to tell the server to mount the partition on that folder. Edit the file by opening it in your favorite text editor, in my case this is “Nano” which is default on Debian servers, but you might have to use “Vi” on other servers. This guide will only cover how to do it using “Nano”. Note that because I have a lot of partitions on my first hard disk, I probably have a lot more lines than you. Move the cursor to the bottom by using the arrow keys, until you are on a empty line. The “errors=remount-ro” makes sure that if any errors occur the partition will be remounted in read-only mode, this makes sure that you almost always are able to read your data. By adding the mount point to “etc/fstab” you make sure that the server remounts it upon reboot. There is no output on this command, unless there are any errors. 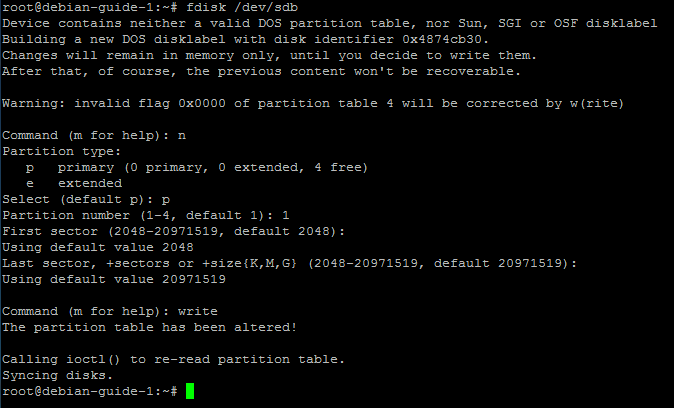 You now have your harddisk partitioned, and mounted, and only need to move your MySQL data in the next steps! There should not be anything else than “lost+found” since you have not created any data on the partition yet. You now have to move the data, and tell the MySQL server where the new location is. Before you do anything below, you have to stop the MySQL server – You MySQL server will be offline and unavailable in this period and I can’t tell you how long it will take. If you have any webpages or other public content that rely on your MySQL server, you have to plan ahead before you do the next steps. Depending on how big your database is, this can take a long time, it will take the amount of time i takes your hard disks to copy the data. You have to remember this path, since you will need it in the next steps. I always choose to copy, and not move. This way I can always go back in case something goes wrong! I then delete the old data, when i have tested that everything is working. When it’s done, you should be returned to the terminal, and you are allowed to write commands again. The command above does not give any output unless there are errors. Here you have the line that starts with “datadir”, this is the one we need to change. Now press CTRL+o (the letter left of “p”) and Enter to save, and CTRL+x to exit nano. Move the old data, to make sure that it is not used by mistake. The data has been moved, mysql have been informed of the new location and everything should be ready to start up the MySQL server again. If there were no errors, and it did not fail, then everything went like expected, and you are now up and running on your new hard disk! Marco was so kind and post a solution for this problem in the comments, and I will include it here too. Now try starting the MySQL service again, and it should work. The description is pretty good but I found some issues with MySQL 5.5.38 on Ubuntu 14.04.1using InnoDB. 140829 7:25:16 [ERROR] Can’t open the mysql.plugin table. Please run mysql_upgrade to create it. After some investigations, I found a useful indication here http://stackoverflow.com/questions/4182468/moving-mysql-innodb-database-to-separate-drive where they mention to update the apparmor file /etc/apparmor.d/usr.sbin.mysqld. In particular you need to modify any /var/lib/mysql reference to your new /mysql_data. After that modification, I restarted mysql server and it worked properly. I presume they are related to the lost+found directory that’s created when you format the disk,. Albeit ugly, they don’t seem to hurt. Regarding the lost+found error. You could just move the MySQL data into a sub folder on the partition. In this example it could be “/mysql_data/mysql” so mysql never sees the lost+found folder and won’t include it. Does any one of you know how a sda volume (operating system, MySQL, etc…) and a sdb volume (data) would behave if sda is 7500 rpm and sdb 10000 rpm ? In terms of performance, what would be the speed of such a configuration? Thanks. So a 10000rpm drive will always be faster than a 7200rpm. but only by a couple of milliseconds. You will get better performance out of your mysql instance if your database is located on sdb that is a 10000 rpm disk. It’s not often I make my way through a guide and don’t encounter any issues. This was very thorough, thanks for your excellent walkthrough.